Real time MES – manufacturing execution system, drawing up of material balances, output product costing in the real time (manufacturing business process automation). TRACE MODE и T-Factory Authorized training centers are located in different cities and countries. Some of them belong to AdAstrA, others to its Authorized partners. Wherever they are the TRACE MODE Authorized Training Centers provide quality training services to our customers. 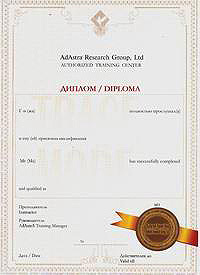 The courses are given by AdAstrA Certified Instructors, using AdAstrA's training materials and the latest releases of the software. All the ATC courses are practice-driven and provide skills that help reducing the development time and cost of control systems projects. Each course makes different requirements for the trainee’s background knowledge – some courses are for beginners, others are for experienced (SOFTLOGIC, SCADA/HMI, EAM, MES, HRM) users wishing to increase professional skills. The initial requirements are described in the course abstracts. The students are provided with didactic documentation and with software. Coffee breaks and lunches are included in price. After courses the students are awarded with diploma and after some trainings they may qualify for the Certified TRACE MODE and T-Factory Engineer degree.